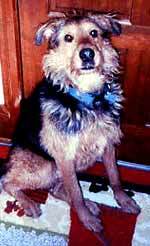 Brillo my first foster from the prior airedale rescue group, SSAR, lived at Waggin Tail Farm for many years until our best friend Buddy adopted him. Well, Brillo indicated that Buddy was his idea of a dog’s man. Buddy and Brillo lived many years in their man cave with a manly yard. Of course, they were best friends. At least 14, Brillo passed over last week following minor surgery. Run Brillo run!